The PDF file for The World of Calidar's CAL1 "In Stranger Skies" is on sale on DTRPG today. The sale ends Nov 2nd. Grab it now while the sale is on! 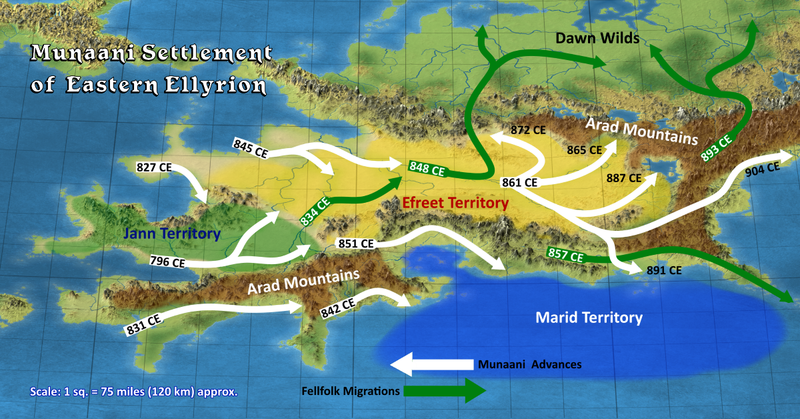 Here's the first part of an overview of Calidar's planes, as they relate to how heroes and deities might travel through them. Ambrosia: It is the universe to which gods generally ascend. It may also be defined as a “celestial plane.” In whole, it can be visualized as a sphere, with an infinite number of possible godly domains nested on its inner surface. At the center lies the wondrous land of Geth (pronounced “yeth”), with a sky-like space above and an underground below. The land’s orientation is undefinable as it swivels and warps ad infinitum to connect with each of the gods’ magical realms. Geth looks like a vast wilderness shrouded with silvery mists. It features regular periods of twilight and darkness, as well as ethereal storms, though there are no moons, stars, and sun to be seen. It is a universe that only beings of divine or quasi-divine status can enter. Lesser creatures can come when invited by the gods or accompanied by their servants. It is customary for newly ascended gods to explore Geth’s mysteries, so they may hone their divine skills and earn a fine mythology. Deities residing in Ambrosia dwell in veiled hideouts on Geth or magical domains. Most gods belong to pantheons of peers who pool their resources when building such domains, which are individual pocket planes surrounding Geth. This explains the need for deities or their servants (called psychopomp) to lead worthy spirits of the dead to their rightful places. Divine domains were originally described in CAL1 “In Stranger Skies,” page 62. Ambrosia is a frightening dimension where even gods can be destroyed. Although the deities of monsters or those of alien worlds aren’t described in CC1 "Beyond the Skies," they do exist, and they are just as fearsome to Calidaran gods as the perils their followers face in the mortal world. Throngs of worthy servants may accompany traveling deities. If gods are ever destroyed, their priors can no longer commune with them or cast spells. The unfortunate news spread quickly among mortals, causing widespread despair and disorder among them. By way of missionaries and prophets, other gods will soon seek to sway to their cults forsaken priors and their followers. The Netherworld: Also known as the Astral Plane, it is the place where the spirits of the dead linger before they meet their final fates. Though they look totally unlike, the netherworld and the realm of the living (also known as the prime universe, which includes Soltan’s ephemeris) occupy the same space. Both are infinite. Certain outer planes may feature their own netherworlds, as appropriate to their natures—the various realms of the dead interconnect through a web of wormholes. 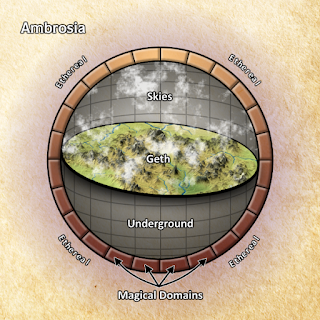 Elemental planes and Ambrosia do not feature a netherworld. Elemental beings revert to their basic nature if deprived of life. Though the undead can create gods in their own image, gods cannot become undead. Vaguely similar to the netherworld in its appearance, the ethereal is nearly as dangerous as Ambrosia itself since many entities cross through it during their journeys. Others fantastic predators dwell there, some large enough to swallow a straying skyship whole. The Ethereal: This plane acts as a buffer between the prime universe, the inner planes, the outer planes, the netherworld, and the Ambrosian dimension. 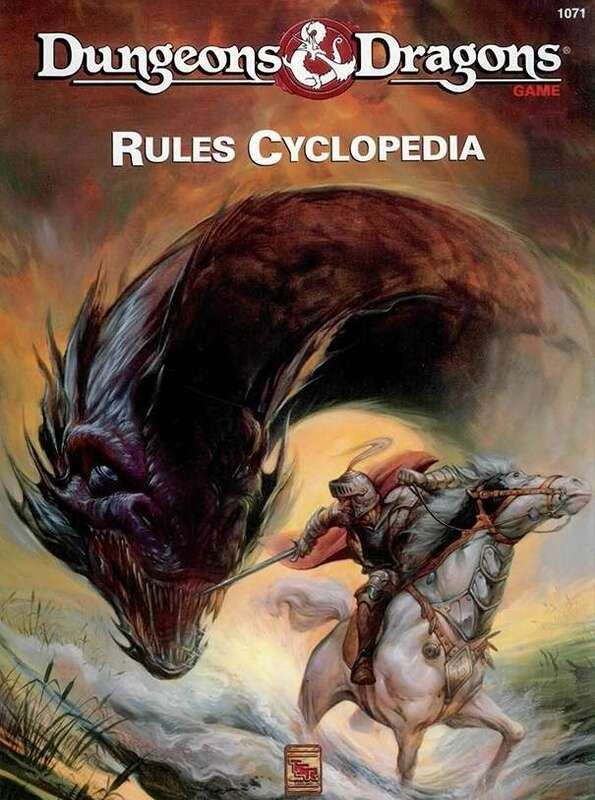 It is a good place to feature outer planar visitors, gods, their servants on a mission, the undead, demons, and all sorts of bizarre creatures that do not fit the prime universe. Another thing: all of Calidar's videos are available on the new website. Click Here for all the videos to date. This is a lot of fine people. This ought to be fun. I'm not sure yet what event I'll be running, as these news just came down. Likely: a Calidar session using BECMI game mechanics, and possibly a seminar on world building. Maybe more. The convention takes place early June--based on current projections CC1 "Beyond the Skies" (Calidar's 2nd book release) is slated for the summer of 2016. Early June is possible but cutting it really close for the new book's availability at the convention. Although possible, I may just have a prepress version for demonstration. This is good news either way. Hope to see you there. Until then, I'll also be at Lake Geneva's Gary Con, in March 2016. Cheers! 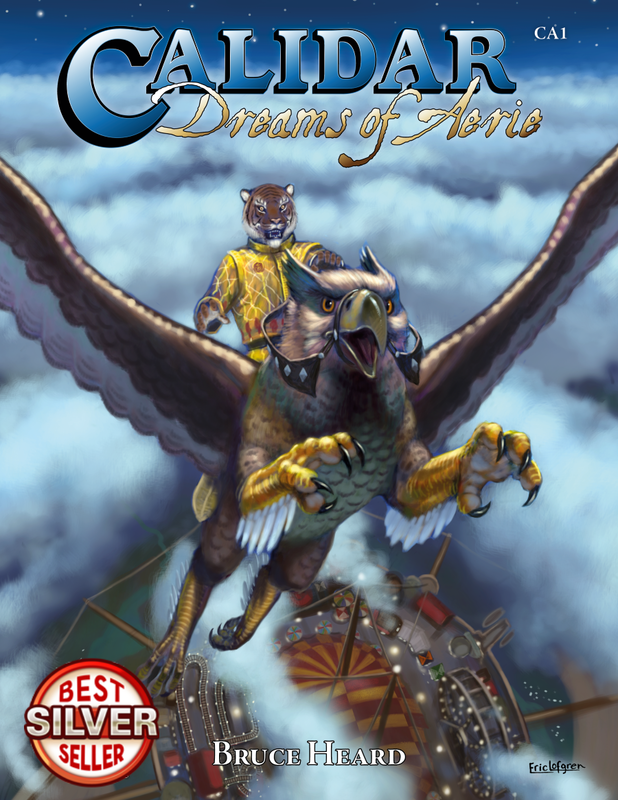 At long last, I've finished the gods writeup for CC1 "Beyond the Skies." It took far longer than I'd anticipated due to the sheer size of the project and detail I wanted to include. This is more than a match for CAL1 "In Stranger Skies," both quantitatively (it's at least twice as large) and qualitatively. With 88 deities, each with their own storylines, crosslinks between them and those of other pantheons (one per Calderan realm), and a focus on how this affects mortals who created them, this new book casts a new and amazingly revealing light on the whole Calidar universe, the netherworld, the outer planes, and the Ambrosian domains of the gods. The book is full of benefits and powers for the faithful, ranked according to their degree of piety. The servants of the gods and their foes are given in great detail, as well as a closeup look at the shamans of the Dread Lands, and how to manage the effects of Calidar's deadly wilderness. Another 15-20 miscellaneous godlings, demon-princes, and other quasi-divine beasties are included, whether they "survived" encounters with fully ascended peers, or they already died at their hands. This brings the number of entities illustrating the faiths of mortals to more than 100. Kickstarter: This being done, I can now concentrate on putting together the ensuing Kickstarter. The plan is to launch funding in December 2015, ending very early in January 2016. If all goes well, at that point, I'll be able to contract artwork and final editing. The final target for release should be several months afterward, depending on contracts and personal availability of the artists I would like to see involved with this project. More later on this. Release Date: Without knowing more, I'm projecting summer of 2016 as the final release, provided all goes according to plan. Thank you for your patience. There will be more announcements in the close future as details come together. Please do pass this information along. The greater the success of this Kickstarter, the more art will grace this new book's pages--with this many deities, we've got our work cut out for us! Thanks. 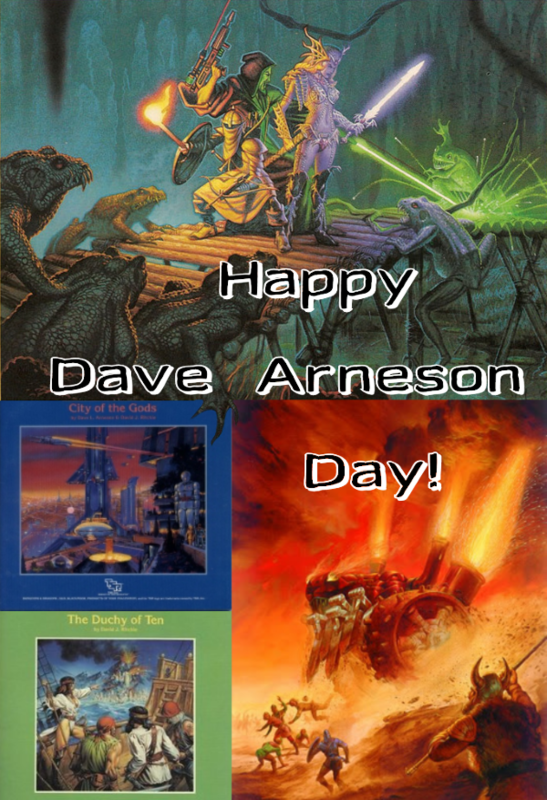 Just for the fun of it, I drafted a series of banners for use with Facebook's Mystara Reborn page. Many of you aren't on Facebook, so I decided to post the collection here. Hope this brings back some fun memories as you scroll down through this post. In the wake of the insolent rebuke, Akram secretly negotiated with the djinn, infidels and believers alike. He granted to the faithful the right to live among the people of Narwan, provided they did so openly. He also agreed that efreeti infidels would dwell in the desert, away from settled areas, and that the emirates would not encroach upon their domain if these djinn kept to their own as well. To seal negotiations with the infidels, the Caliph of Fustat convicted the Companions of using djinni magic at the Trial of the Silk Turbans, 1331 CE, branding them as outlaws. Those who failed to go underground and defied his authority were lured to places of ambush across the realm, and massacred during what was called the Night of the Khanjar in 1335 CE. Surviving Companions quickly moved the artifact to a desert hideout and once again resumed a secret life. Whether the First Caliph of Narwan had meant to respect his promise to the efreeti infidels remains a mystery, as he was assassinated in 1348. Intrusions and encroachment happen now and then, prompting brutal and usually deadly responses. Neither is it clear whether the desert djinn would keep their promise forever. Meanwhile, those who’d been converted live among Narwan’s upper class, often work as advisors to the emirs or to affluent sheiks. They stand as guarantors of a fragile peace between Narwani and desert efreet. Priors watch them to ensure their faith is true, while wizards do the same to prevent the djinn from abusing their powers at the expense of the Narwani and their rulers. Current laws prevent the djinn from holding nobility, office, or clerical titles, barring them from leadership. Desert spirits, Narwani justiciars, and Nicarean spies still actively look for Companions of the Black Rose. They all covet the artifact. Djinn infidels consider it an abomination which should be destroyed. The caliphs wish to hold it as the symbol of their spiritual ascendancy. The inquisition hopes to use it as a weapon to regain control over what they still call Eastern Ellyrion. Though they do not submit to the caliphate’s authority, Companions remain devout followers of Soltan and, therefore, their divine liege takes no action against them. Neither will he interfere with the caliph and those who serve him, or the Nicarean inquisition, for they all serve the same god. In his view, the worthier party will prevail. Meanwhile, the sect continues its mission to convert infidels (of which there are plenty) and to protect the meek from their masters’ abuses (of which there are even more). 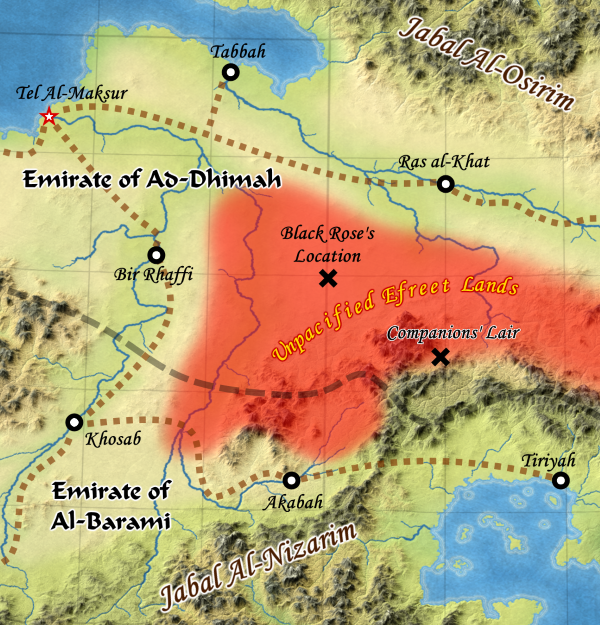 The secret shrine of the Black Rose lies in the most deserted corner of the Emirate of Ad-Dhimah, atop a rocky spur of the Nizarim Ridge, a hundred miles south of Ras Al-Khat. Very few Narwani dwell in this inhospitable land. Desert djinn are more likely to wander about, searching for the shrine and for imprudent travelers daring enough to trespass. 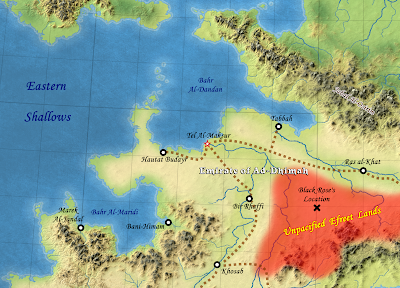 The sect adopted its name because of a mystical desert rose a band of adventurers had unearthed in the Ad-Dhimah wastelands. Rather than the common sand or pink-hued gypsum concretion, this one was black and made of something similar to obsidian, but infinitely harder. After extensive testing and divination, the adventurers concluded it was an ancient artifact, a holy relic of divine origins. It seemed to give its owners an edge against the djinn, stealing some of their abilities for some time. The Companions saw Taneth’s spiritual patron Arun-Te more as “Soltan,” the great lord of the sun but also of the desert—their god, the Spirit of Narwan. They called him Arun Al Malik Al Soltan. Whatever his true name, it was he who’d buried the object in the desert as a weapon for his faithful to overcome the djinn. While continuing to oppose the inquisition, Companions also targeted the djinn at the heart of the conflict. As Companions fell, others took their place, all in the name of Soltan-the-Munificent. Universally reviled, the Nicarean inquisition had nearly withdrawn by 1167 CE, limiting their actions in Eastern Ellyrion to spying (mostly on Nicarean forces there). A protracted fight went on with the desert spirits, as the Companions endeavored to convert them to the rightful cult or to force them back to the wastelands. Likewise, the newly-styled faith also attracted disenchanted colonists from the ranks of traditional Arun-Te believers. In 1208 CE, while Nicarea redoubled its repression of the colonies, the Black Rose and the “hidden ones” became instrumental in causing Eastern Ellyrion to secede from Munaan, both camps wishing to neutralize the hated inquisitions once and for all. Exploiting the clash with Talikai islanders, pawns of the djinn and of the Black Rose contributed to the imperial viceroy’s expulsion (see Historical Timeline in CAL1 “In Stranger Skies”, page 80). The former Munaani colony thus became known officially as Narwan. The old imperial districts grew into emirates, with a caliph overseeing all spiritual matters in Soltan’s name. Despite their common achievement, the djinn and the Black Rose continued their struggle. With the help of efreet converted to the cult of Soltan, the Companions regularly gained ground during the next century, uncovering the infidel spirits hidden among the people of Narwan, expelling them, converting them, or slaying them. 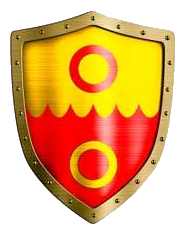 Most powerful and popular, the sect had reached its zenith. Yet, in its success lay the seed of its downfall. Companions of the Black Rose had become a threat to Narwan’s new ruling elite. The Caliph of Fustat, Akram I saw the sect as a growing political liability, an arrogant rival faction claiming the ability to convert desert spirits to the cult in whichever manner best served its purposes. By then, the existence of Soltan’s artifact had also become common knowledge. The caliph, who wasn’t a djinn, thus demanded prominent members of the sect to hand over the holy relic at once to prove their loyalty. Its keepers promptly refused.